I really like to heard your opinion about this 2 items. I got confused when I see they had different bottoms ( glassed and unglassed). Thank you. Thank you very much for your time and expertise. My best wish for you. The foot rim itself looks old, but is Yuan dynasty, Ming or a later copy of such? I cannot tell for sure. As I already mentioned with the other item, my experience is insufficient. One thing that I am unsur of is the bottom. 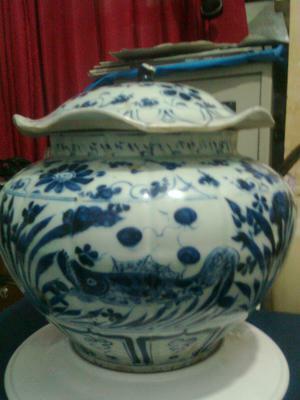 Yuan and early Ming dynasty items usually have an unglazed bottom. 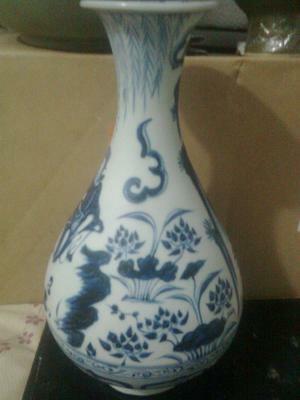 In addition, the shoulder of the stylized lotus petal decoration along the base is too round for Yuan. I cannot tell for sure with this item, I'm afraid. The bottom is a bit too rough for my taste. The lotus petal decoration is more like Yuan dynasty decorations should be, but I am not sure at all about the rest. The relevant features of the small bowl you presented last week were relatively easy to recognize, but with these two only the lotus petal decoration is easy to acknowledge. Not sure about the rest. You still should consult with some museum or other expert to make sure. Not sure if anyone visiting this blog is knowledgeable about Yuan wares. Honestly said, even with the one you showed last time you have more than most collectors can dream of owning.